after a nice, low-key weekend, we find ourselves in the 10th month of the year. rodney and i have started talking about what to do for thanksgiving; we may even attempt our very own turkey, stuffing, potatoes, and gravy. i’m pretty sure i can handle the latter items, but i’ve never attempted a turkey. i feel like it could go really amazingly or pretty awfully. you’ll find out either way, gentle reader. in other news, jones finally had a solid poop on sunday. i almost had him pound it (our version of high-five or shake) during our walk, but it was drizzling and we all wanted to get home. turns out they both really like rice, broth, and chicken mush. i decided to work from home today so i could keep watch on jones. i could hear his stomach gurgling this morning after i let him in before breakfast. breakfast (and dinner last night) consisted of cooked jasmine rice, chicken broth, and blue diamond senior chicken (which they get every day anyway). i didn’t see if he pooped this morning, but i wasn’t impressed by the one on our afternoon walk. i’ll spare you the deets, but i’m still hoping it’s just a dog stomach bug that somehow merle didn’t get. it was raining, nay, pouring on tuesday, so i couldn’t walk the dogs after work. i made sure they went out for a second to pee since they’re both pretty good at holding #2 for a time. 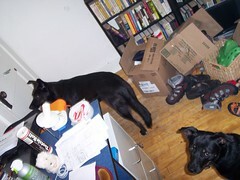 when we got home tuesday night, jones had made a mess in the living room. he managed to get poop almost everywhere on the hardwood and even stepped in some. i cleaned up and didn’t get mad at him. so, either something is stressing him out, i need to let them out once again right before i leave, i need to work from home longer during the day, or he’s sick. tonight, i’m going to make some white rice and pumpkin for him for dinner. he’ll probably hate it, because it’s not meaty. i really hope it’s a situation that will pass quickly. i’m excited for this weekend; probably because we have nothing specific planned. i kinda need a few things at costco but not really, so i may postpone the trip until next weekend. a wilson’s friend gifted us about 30 bluegill filets which i am more than excited to turn into fish tacos. we’d like to have him over for them for dinner as a thank-you, but he’s old school, so he may not appreciate the taco aspect of fish tacos. i said i could serve them “deconstructed” (and then i laughed) because it would sorta be like a fish fry except the slaw would be pickled red onions and the dinner roll would be a couple tortillas. we’ll see what he says about it. i need to put vacuum to the couch because it’s still covered in cat hair and we’ve had the windows open the last few days and i’ve been unable to breathe through both nostrils at the same time. thankfully, i bought an 8-pack of kleenex from costco the last time i was there. since merle gets a lot of photo love, i thought i’d share some pics of jones with his turkey toy. eight years ago, mayor dave won. seven years ago, i bought my first 2nd gen ipod, and was one of two lone people in the movie theater to see eternal sunshine on my birthday. six years ago, i was in nyc for my bday week. though, it seems like a million years ago. jones came into my life five years ago this month. four years ago, i found my first grey hair. three years ago, i installed a front walk, built my raised-bed, and had the bathroom redone. two years ago was kinda boring, it seems. and last year, well, you know. the dogs had their annual wellness exam, heartworm check, and lepto shot yesterday. they both passed with flying colors. except that they could lose a couple pounds? i wonder if we should change their annual date to sometime in august or september after they’ve been running around all summer getting trim and fit, instead of march when we’ve all put on a couple pounds trying to keep warm. we’re sitting in the computer room with the door shut because the guy installing the dish is afraid of dogs. so we came home to another catastrophe. apparently nora decided to tear apart the remaining dvds on the table (therein which lies a lesson for both kurt and nora). what’s interesting is that she left the plastic chopsticks completely alone. like they weren’t worth damaging. jones was, again, sorry and submissive. i think i ought to get a webcam to ease our discontent. or to provide humor. i came home to a small mess this evening… it would appear that someone got into a (yet unpacked) plastic bag with sunscreen and ferret shampoo and they managed to keep all of the shampoo inside of the bag, thankfully. judging from the possible suspects’ reactions, it would appear the guilty one was jones. this is unfortunate, because i know that it was nora. jones is just the one who knows that whatever happened was wrong and gave me the sorry face for it. nora is definitely benefiting from being a “second-child”. i did not scold her nearly as much as jones has had it in the past. mostly because she would have peed, but secondly because she probably didn’t remember having been the culprit in the crime. in an unrelated note, my back has a huge knot that i can’t seem to get at.